House with 4 bedrooms, 4 bathrooms, 2 private terraces and a pool. 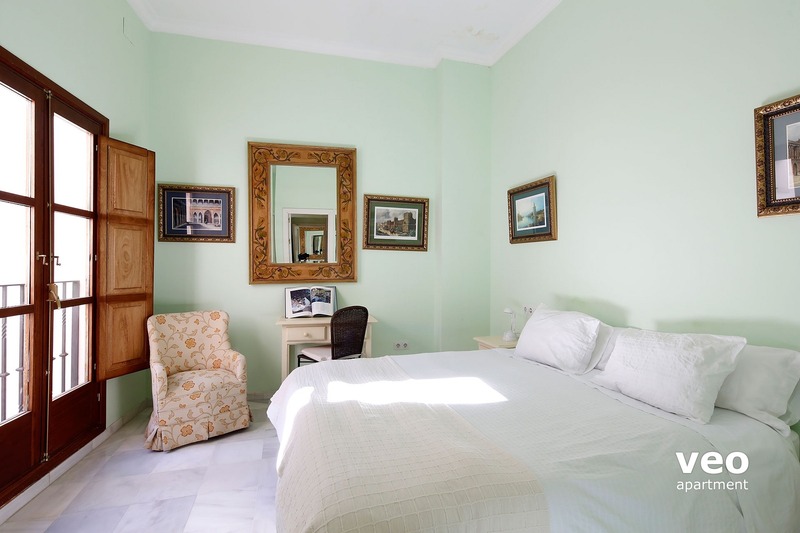 It is located on a quiet street in the Macarena neighbourhood, a short walk from Seville's main attractions and sights. Suitable for up to 8 guests. 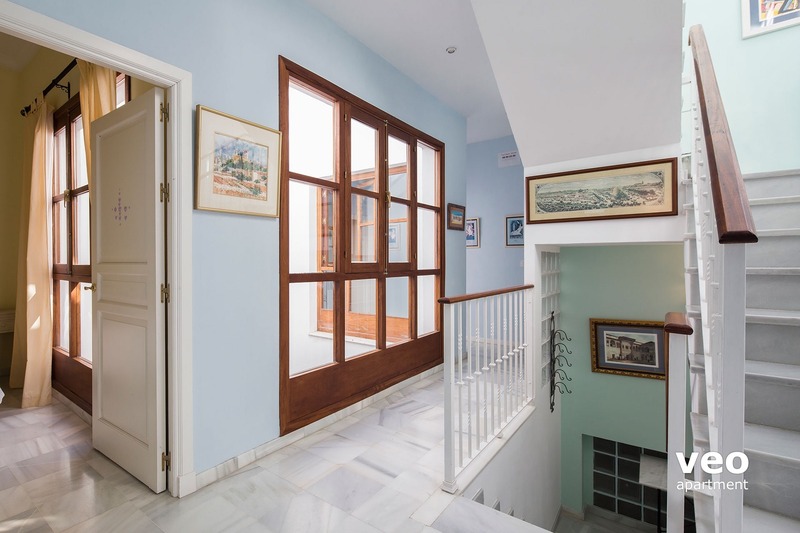 The apartment is on the first and second floors of a traditional Sevillian house (without elevator) and has a separate private entrance at street level. The living room is on the first floor; as are three of the four bedrooms. 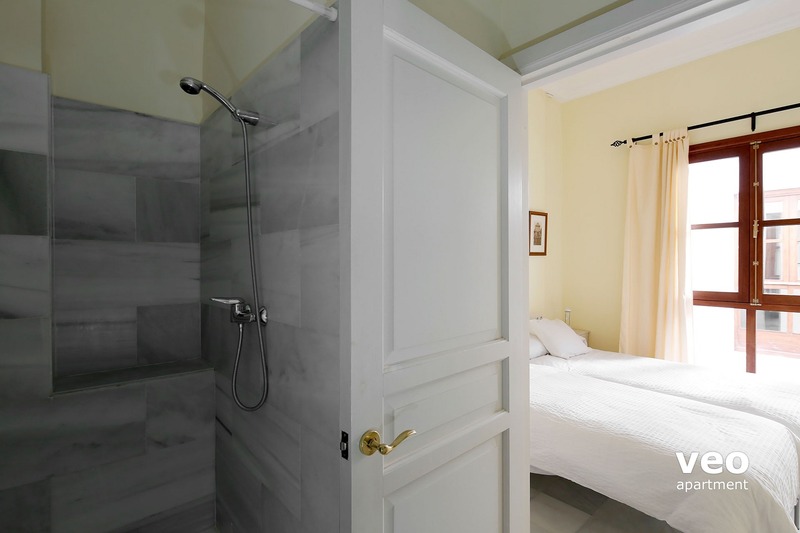 The master bedroom has a double bed and an en-suite bathroom with a bathtub. 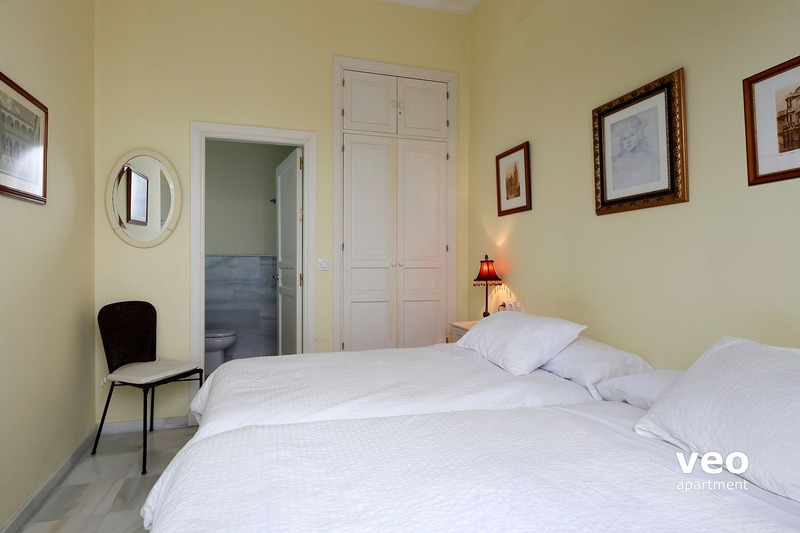 There is a twin room with beds placed together, also with an en-suite and a further twin room. 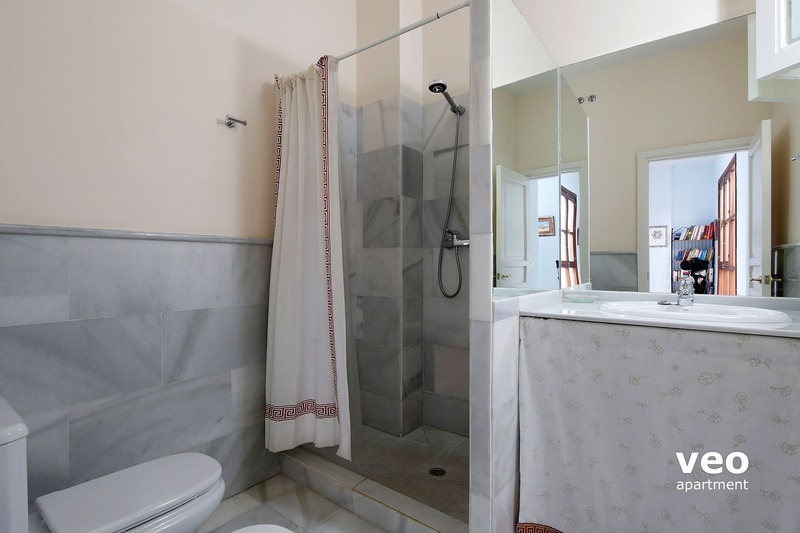 There is also an additional, separate, bathroom with shower. 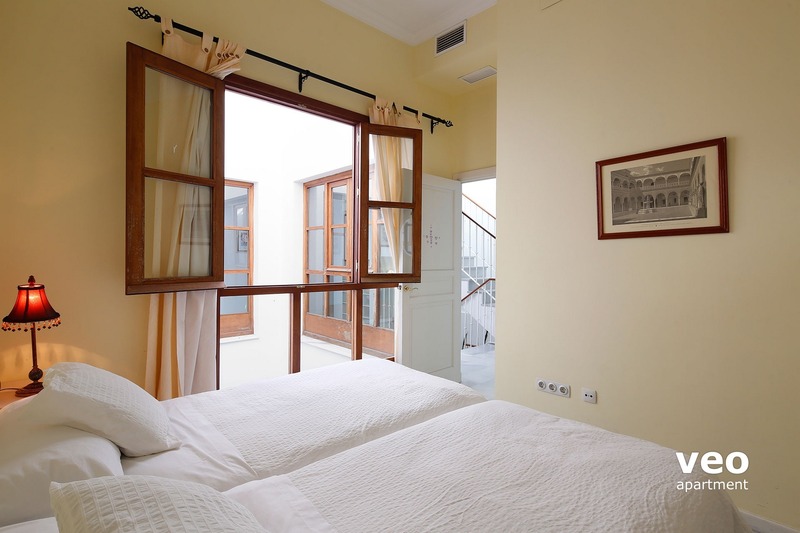 On the second floor is the fourth bedroom with twin beds and the fourth bathroom. 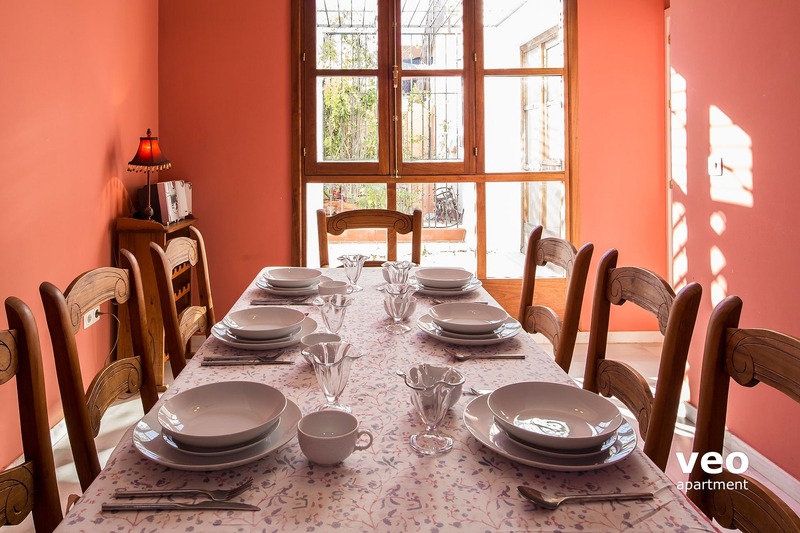 There is a large separate dining room and a well-equipped kitchen, which includes a washing machine and dishwasher, and access to the terraces. 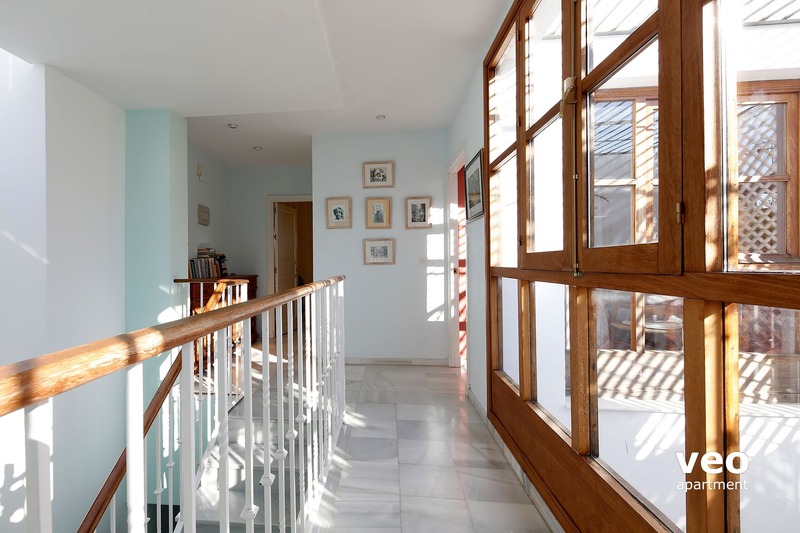 The main terrace feels like an extension to the kitchen, as a door leads directly onto it, and the top terrace is reached by a short flight of stairs. Furnished with sun-loungers, it makes a perfect spot for sunbathing. The sizable private pool measures: length 6m, width 4m, depth 1.60m. Pool available all year round (unheated). There is also an inviting, plant-filled pergola with a table and chairs - a perfect place for a meal and to enjoy the sunset after a day spent visiting the city. Upon arrival, you will be required to pay a refundable security deposit to cover any damages, etc. For this apartment, the deposit is: 250 €. Pool available all year round, unheated. Use of the pool from 9am to 10pm. Measures: length 6m, width 4m, depth 1.60m. 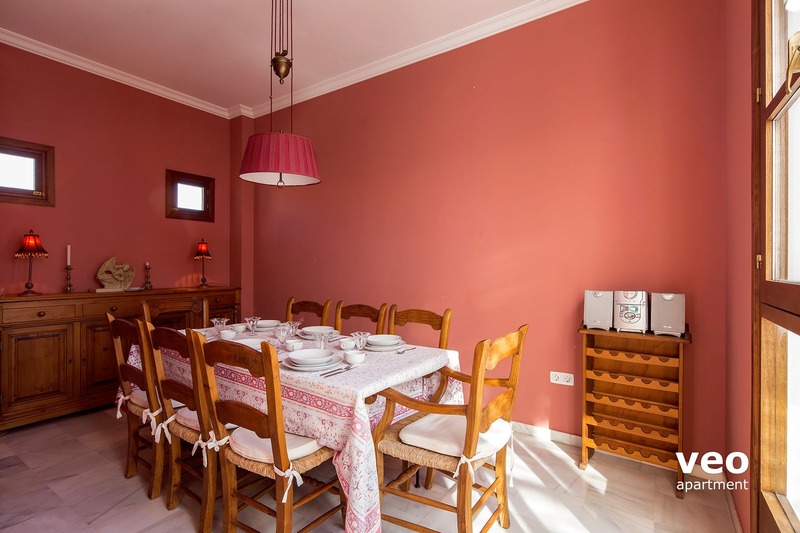 This apartment is in a very quiet residential street - therefore it is COMPLETELY UNSUITABLE for groups who wish to hold fiestas with loud music, etc. My daughter, 4 granddaughters and I spent a month at Miguel Terrace. 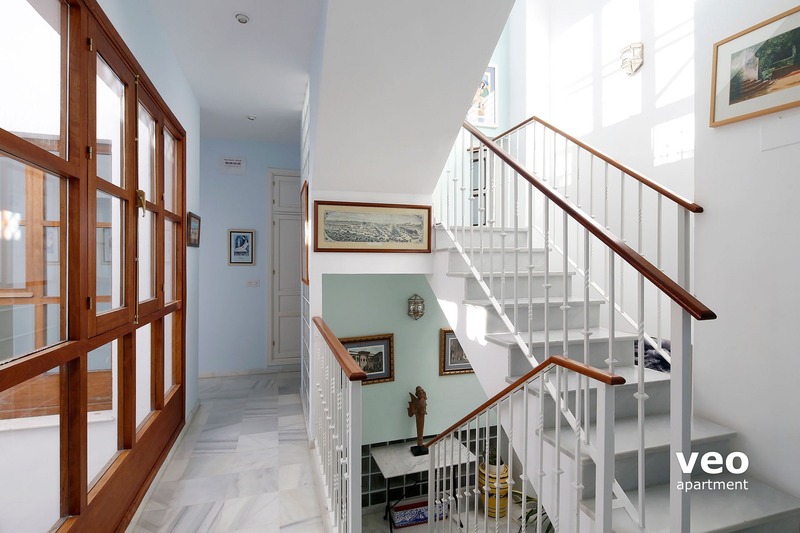 This is a lovely home in a real Seville neighborhood. We all had great places to come together and plenty of space for privacy. We loved the pool and terrace areas. 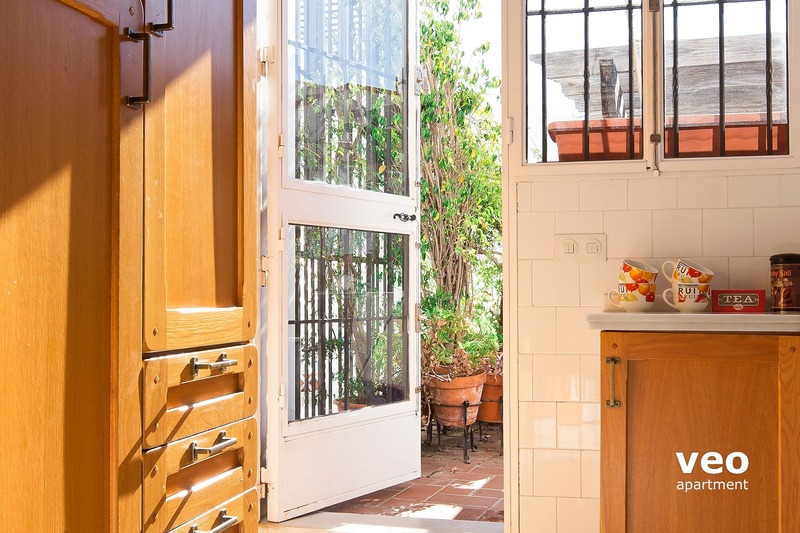 The kitchen is right off the terrace and very functional. We loved the Feria market for grocery shopping. I highly recommend Ramirez Jamoneria y Queseria and Isidore produce. There are tons of cute restaurants and bars nearby. The Alemada is also very close.We loved breakfast at Ottos. If you want a great massage, I highly recommend Masaje con Karma with David Sergio if you want an outstanding massage. Veoapartnents was very responsive when the air conditioning quit working. They had it up and runnng the next day. There are WiFi issues which the staff tried very hard to rectify. I think the owner needs to upgrade their WiFi system. The staff from Veoapartments who we dealt with, Paula, Pauline and Joao, were fantastic. I would definitely rent from you again. I would only rent this particular property if the WiFi is upgraded. 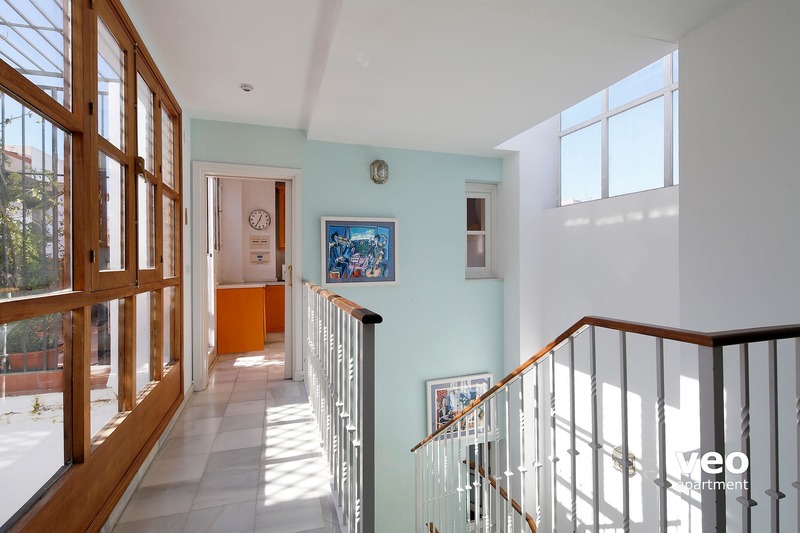 Spacious and well located with effective air conditioning, a beautiful terrace and a much appreciated swimming pool. Great area of the city in a quiet area yet convenient for the sights, shops and restaurants. The apartment is ideal for a group (7 pers.) 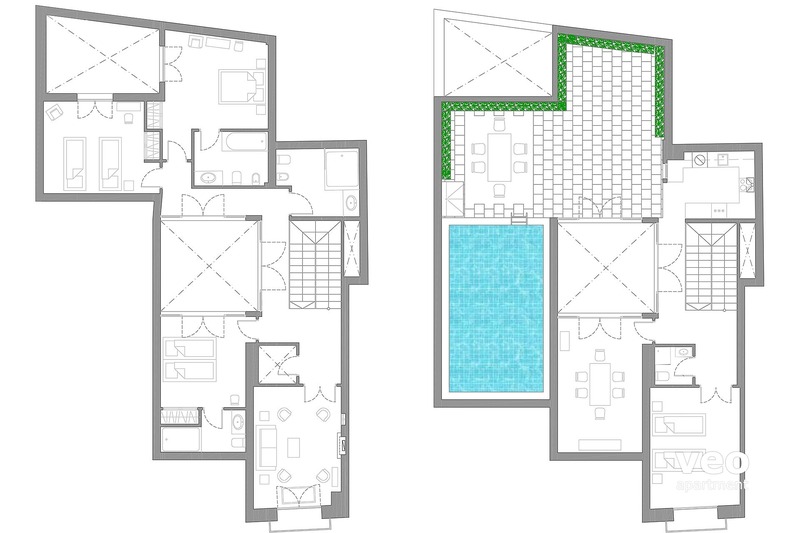 friends : 4 bedrooms and 4 bathrooms = enough privacy. A refreshing splash in the pool after a hot day in the city completed the holiday feeling. We were 8 people there had 4 nights in the apartment. We loved the apartment. The terrace was excellent and big. The wifi worked, we got 2 set of keys, and the rest of it worked. The only thing was the swimmingpool could be more clean. The location was perfect close to everything. They recommended a taxi company where it was easy to book and they had some good drivers. Excellent location, nice apartment (+terrace+pool!!! ), helpful staff. Very nice, comfortable apartment. Well appointed, everything you need for a holiday. "The pool was a big plus"
We had a great time in Seville. The apartment allowed for privacy and a location that made access easy. The pick up was efficient and reliable. Air-con and a pool were the added plus. Very good. 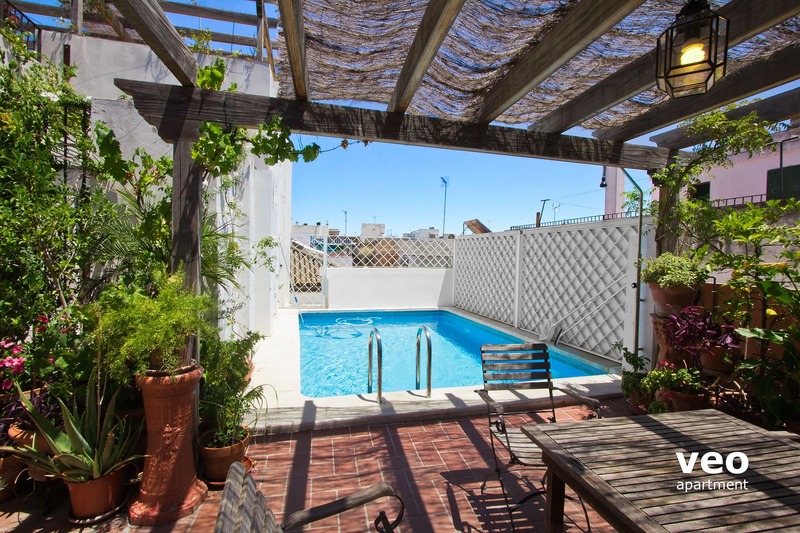 Clean, comfortable with a lovely terrace and pool. Lots of space for 7 people. 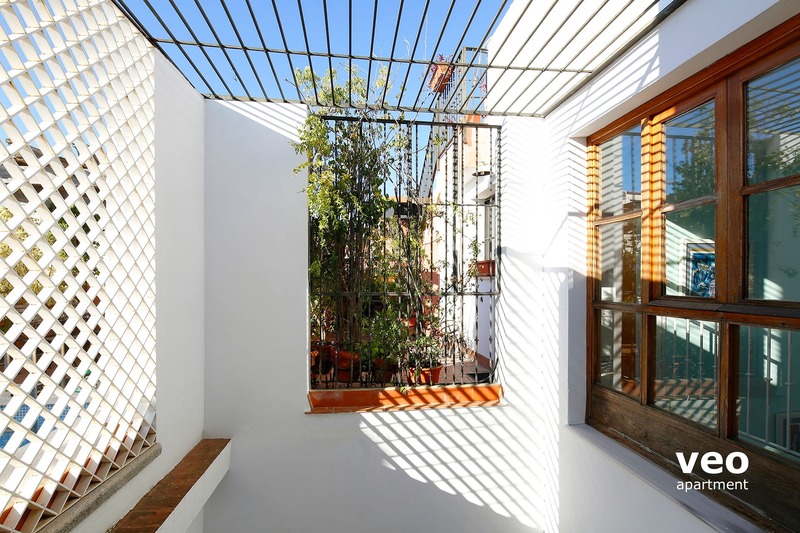 Well placed for getting to the centre of Seville and convenient shops around the corner. It is on a quiet street but there was a little noise at night. "Excellent séjour passé à Séville dans l'appartement Miguel terrasse !" Appartement très joli, propre et spacieux, dans un quartier calme et à proximité de l'Alameda de Hercules, piscine très agréable, dont nous avons profité avec bonheur tous les jours en rentrant de nos visites (il fait très chaud au mois d'août!). Problèmes d'humidité sur les murs dans certaines pièces, dûs à la piscine sur le toit visiblement, mais qui ne nous ont pas gêné. Apartamento muy funcional, grande, en buen estado y con la opción de la piscina, muy conveniente en temporada calurosa. A brilliant, well equipped house in a great location. The pool is extremely welcoming in the August heat! "Wunderschöne Wohnung und toller Service!" Die Lage und der Grundriss der Wohnung war für unsere Gruppe genau richtig. Genug Platz für jeden, um sich zurückzuziehen und genug Platz, um zusammen zu sein. Ohne den Pool wäre es uns sicher oft zu heiß gewesen, aber so war es perfekt. Es war alles fußläufig erreichbar und unsere Teens haben die Stadt oft allein für sich erkundet. Die schönen Markthallen, das tolle Obst und die günstigen Lebenshaltungskosten haben uns überrascht. Wir können diese Stadt, diese Wohnung und den Service für einen Urlaub nur sehr empfehlen!! La casa está muy bien en muchos aspectos. Pocos alojamientos pueden presumir de tener piscina en la cubierta y esas dos magníficas terrazas. 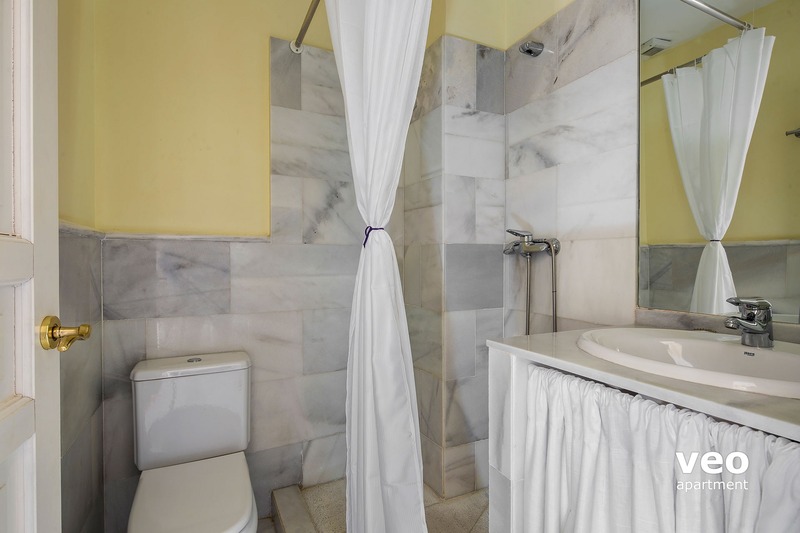 Las habitaciones son amplias, los techos altos y el número de baños perfecto. Guardaremos un muy buen recuerdo de la estancia. Ideaal verblijf voor 8 personen. Het appartement is echt zoals op de foto's te zien is. Zeer goede ligging : heerlijk rustig na een dag slenteren in het centrum. Bakkers, supermarkten etc. om de hoek. Ook het verfrissende zwembad is een luxe. Vriendelijk en gedienstig personeel van Veo apart. Niet twijfelen en huren ! Really great apartment for the group of 8 people or so. The location is very good in the old centre. Very good apartment, very well equipped, clean, spacious and managed by super friendly people. We really enjoyed our stay! Hope to come back again. Nous avons été ravis de notre sejour à Seville.Nous remercions le personnel de l'agence pour sa gentillesse et son efficacité. 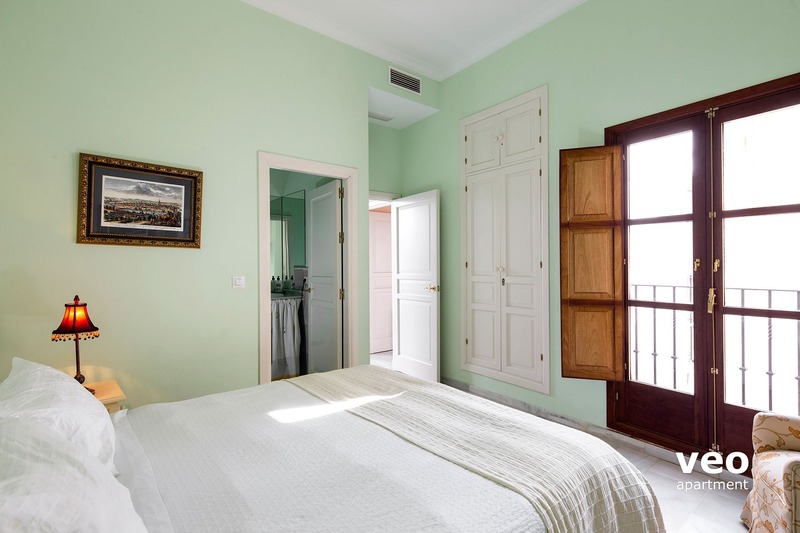 Nice, cleany, roomy apartment in calm part of the old part of the city. Appartement très bien situé dans un quartier charmant un peu moins touristique et pourtant si proche du centre historique. Nous avons passé un très agréable séjour dans ce magnifique appartement avec cette terrasse splendide... Les 4 chambres avec leur salle de bain nous ont permis dêtre tous bien indépendants, parfait pour partir entre amis. Seul bémol le salon au premier étage un peu petit et qui en devient bien moins accueillant, mais la terrasse remplace tous les salons sauf quand il pleut! Appartement conforme à nos attentes! Très bien situé avec magnifiques terrasses qui permettent une vue resplendissante sur Séville. La piscine privée est un véritable atout! "Perfect apartment for our needs"
Spacious with a great outside area. The pool was invaluable in the hot Seville weather. Ideal for larger groups. It accommodated 8 of us easily. Good value for money, the pool is too small for a good swim but ideal for a dip after a hot day. The apartment is well located for some excellent restaurants and is quiet as it is up a non motor lane. Lots of space and excellent air-con essential when it's 45c outside! This house is absolutely gorgeous in every way, the pool is wonderful as is the terrace. Very well equipped. We had a wonderful time. It was excellent choice for our 6 people group . 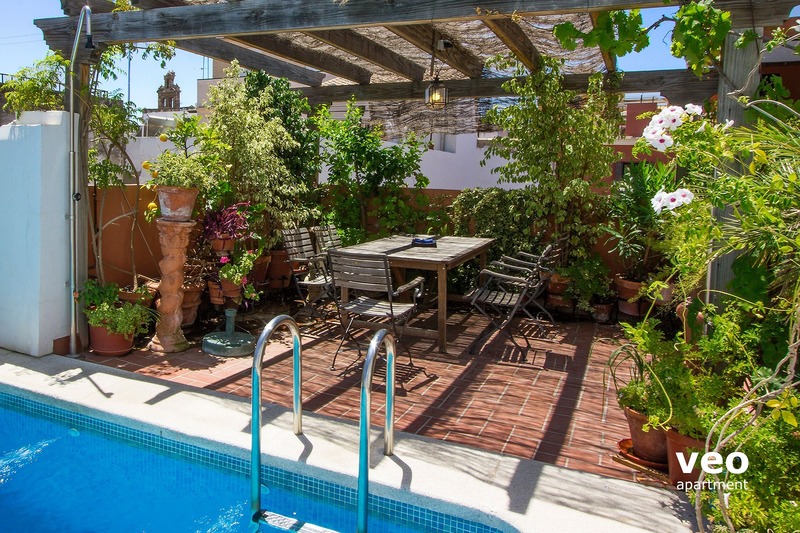 "Sunny Autumn Days in Seville"
This is a good sized apartment for a group of adults and the luxury of a pool in a city makes it ideal for cooling off after a hard day pounding the pavements to see the sights. 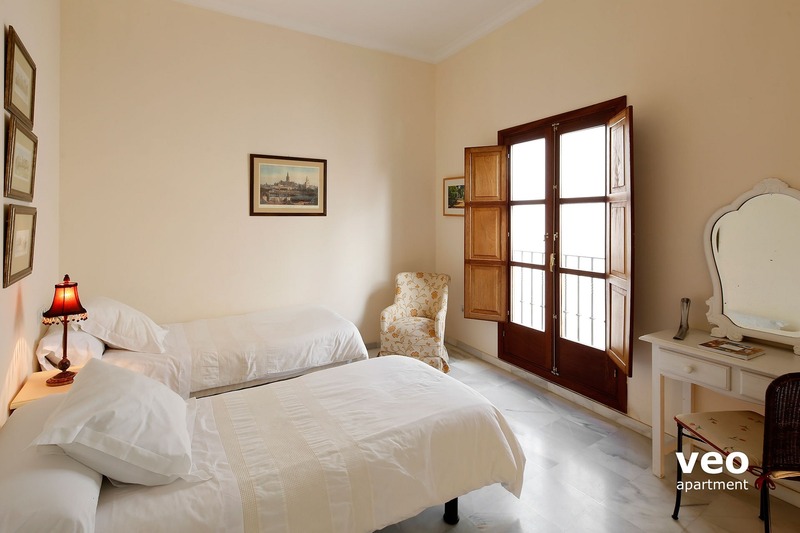 It is pleasant walking the narrow streets and alleys and there is an excellent seven day a week bakery nearby on Feria. It was delightful eating all our meals out on the terrace and great to have a supermarket so close for food and wine supplies. 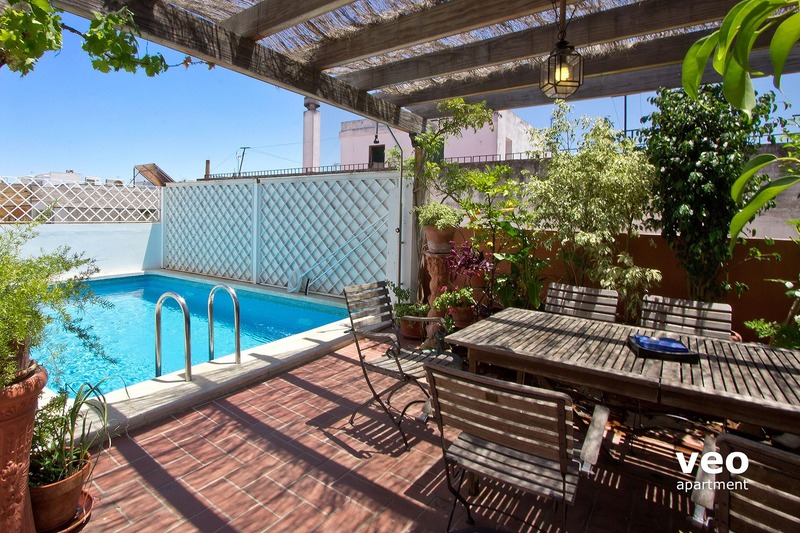 "Perfect house in all circumstances"
I stayed in June 2014 for 10 days, with my flamenco students and it feels like heaven, when you can swim after a intensive dance class! The terrace besides the pool was our meeting point for coffee, lunch and drinks (for breakfast and dinner we went outside). Last week, October 2014, I stayed there again with my 6 cousins. They all loved the house and the pool. 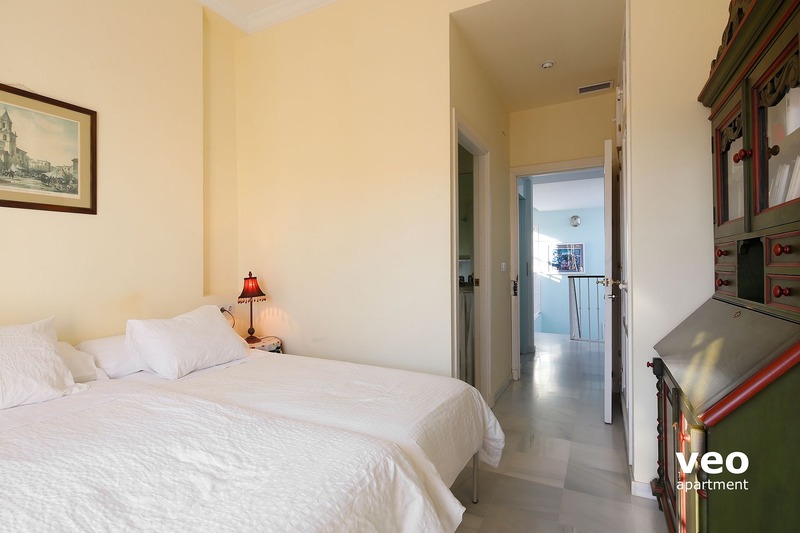 The location of Miguel Terrace is also very good, because it is close to the Alameda, calle Feria and on walking distance of the city centre Santa Cruz. 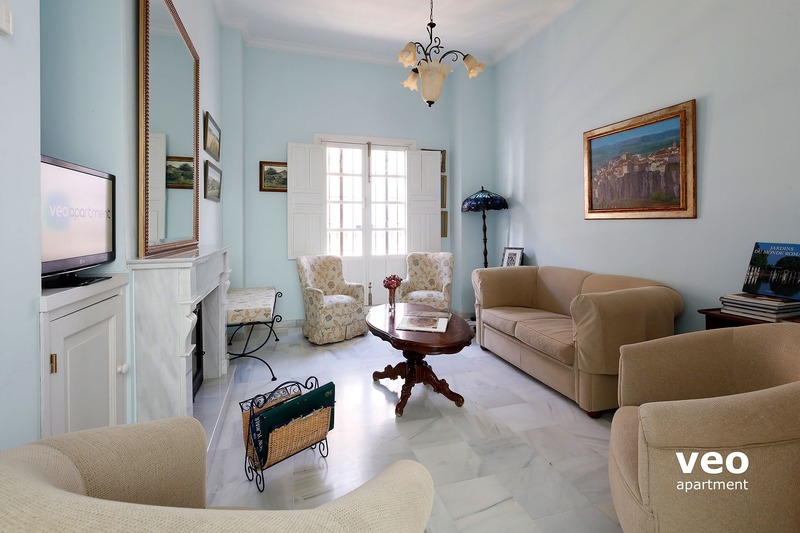 "Excellent apartment in a great location, we would definately go there again." 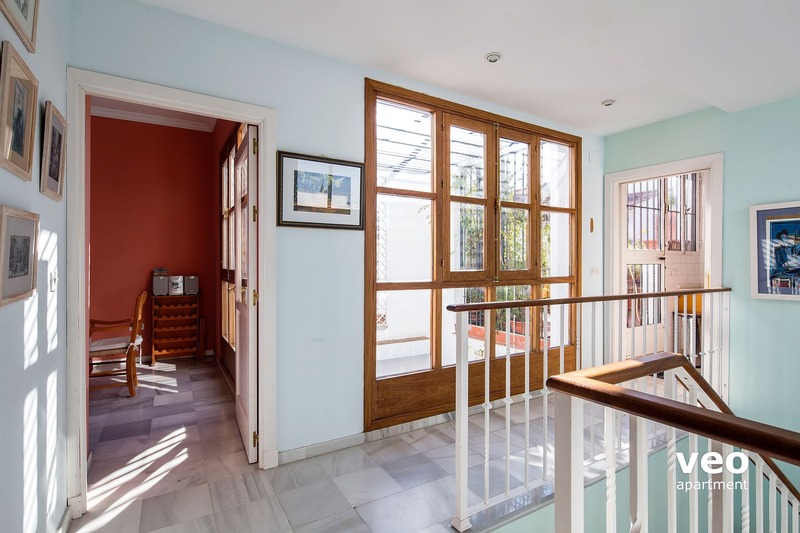 Really great apartment to use as a base for visiting the lovely city of Seville, it was clean, tidy, had the benefit of a pool (9am-10pm) and had almost everything you could ask for on the doorstep including local bars, restaurants and an excellent produce market. Improvements could be made to the available shade on the terraces especially on the top one where there isn't any plus the outdoor seating is a bit basic. 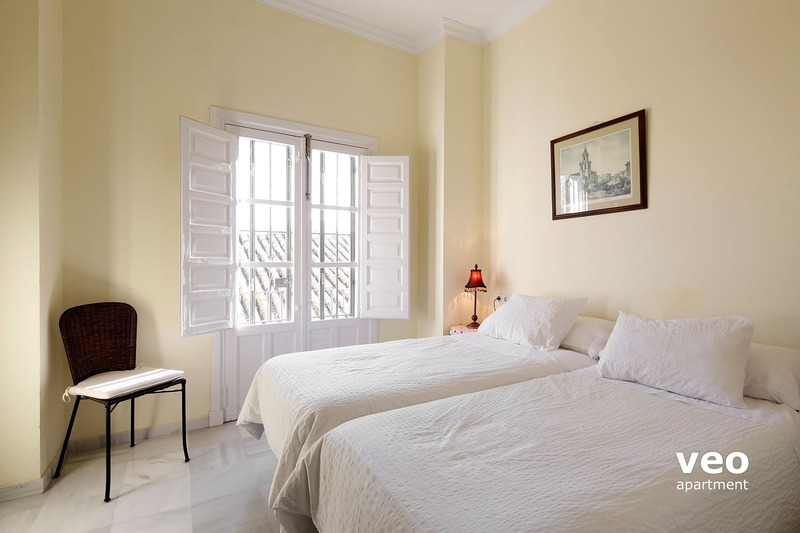 "Another great trip to Seville"
A perfectly located and well appointed apartment that was managed by super friendly agents - I couldn't fault it! Un séjour à Séville qui a comblé nos attentes. Les équipes de véoappartement ont été professionnelles et l'appartement génial. "Great apartment with everything you need!" Very good apartment, clean, spacious and very homely. Also well located, all procedures were very smooth and well organised - pool was an absolute treasure! "Oasis au cur de Séville !" Très bel appartement, fidèle aux photos. La piscine est idéale en été, car les températures grimpent en milieu de journée... L'équipe est adorable et réactive. Quand nous sommes arrivés la piscine n'était pas très propre, et cela a été réglé rapidement. Nous avions chacun notre espace dans l'appartement avec une salle de bain par chambre. Serviettes de bain et de plage sont à disposition, ainsi que thé et café... Nous conseillons vivement cet appartement situé juste à côté d'Alameda de Hercules ! 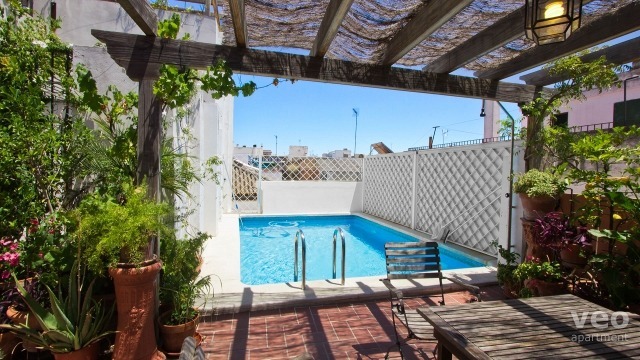 "A perfect place to relax in a quiet neighbourhood"
I stayed in this house with my flamenco dance students for 10 days. How nice to have lunch all together after the dance classes, next to the swimming pool, which was our meeting place at all times. The swimming pool is taken care of twice a week by Carlos, to check the values of the water and keep that up to date. Very good! The kitchen is very well equiped, even a dryer, but we didn't use that one. It is even quicker to hang the laundry on the terrace, because after half an hour it is dry. When it is too crowded, you can go up one terrace higher and relax there. One or two more sunbeds would be nice, because there is only one. The supermarket 'Dia' around the corner, the fresh market around the other corner, just 10 minutes walk to our school Taller Flamenco, and only 5 minutes walk to the Alamede de Hercules. Some of us went to the city center, which is also very easy to reach by foot. And if you're tired, just take taxi. Prices are very low, compared by the prices in Holland. I'll be back in October again in this apartment, yeah! I stayed here with my wife and six members of our family. It was magical. 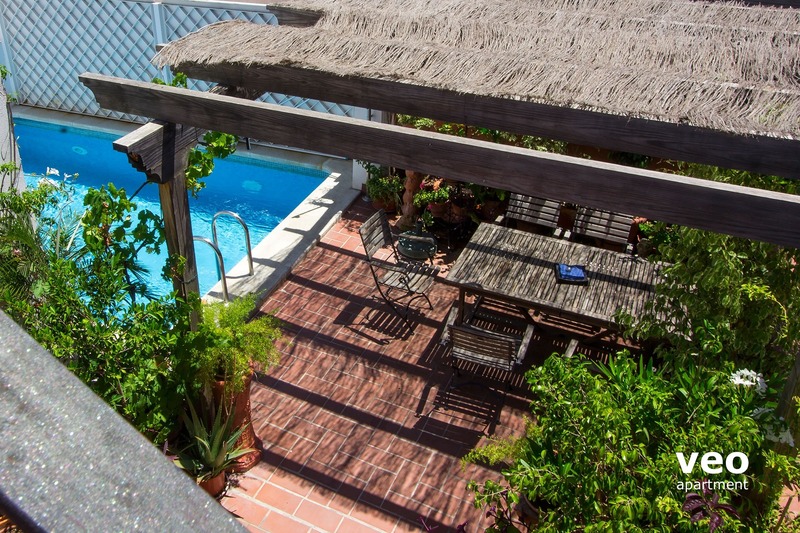 I can't imagine a better place for us to spend a week in Sevilla--or even in Spain in general. We loved every part of the house. Each person had their own space, and yet there were plenty of shared rooms and areas where we could congregate. Most people ate breakfast on the terrace outside, and we often reconvened in the dining room for a late dinner. The house is gorgeous. 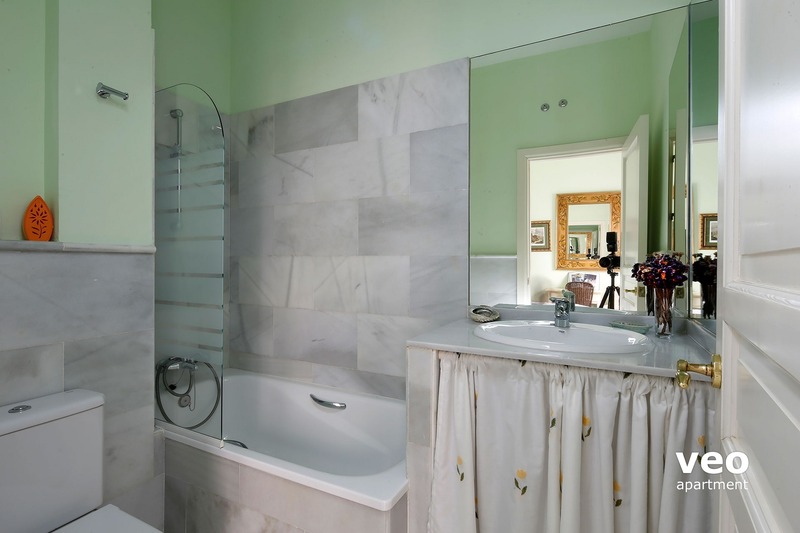 The marble floors were cool and elegant. Even the pictures lent it a touch of the majestic. I wish it was my house. I hope to return again. "A lovely spacious apartment in a great location and perfect for the 5 of us." We really enjoyed our stay at the apartment. It was very well equipped, comfortable and spacious and we particularly enjoyed the roof terraces and the pool. Location is excellent being some 15 minutes walk from the city centre but with good local shops some 5 minutes away. We plan to return to further explore Seville and the surrounding area. 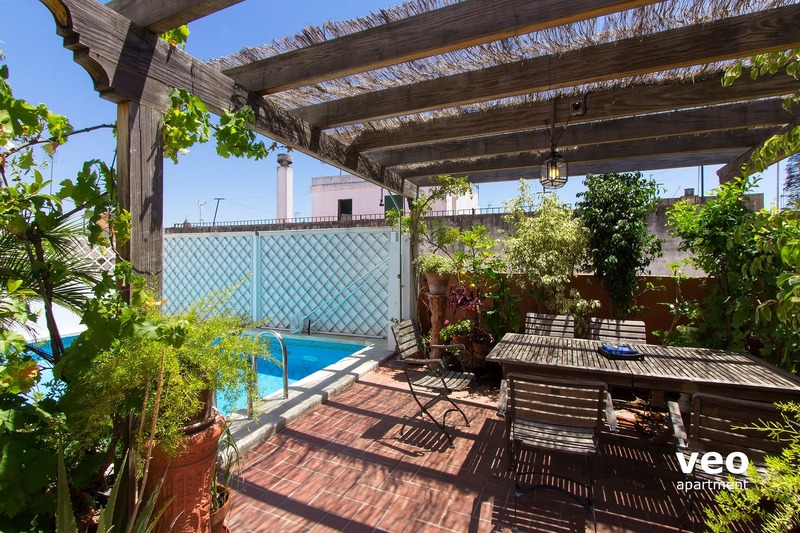 "Very Good Experience at the heart of Seville"
Even though the house was hard to warm up in winter, we still managed to enjoy the beautiful terrace and view. 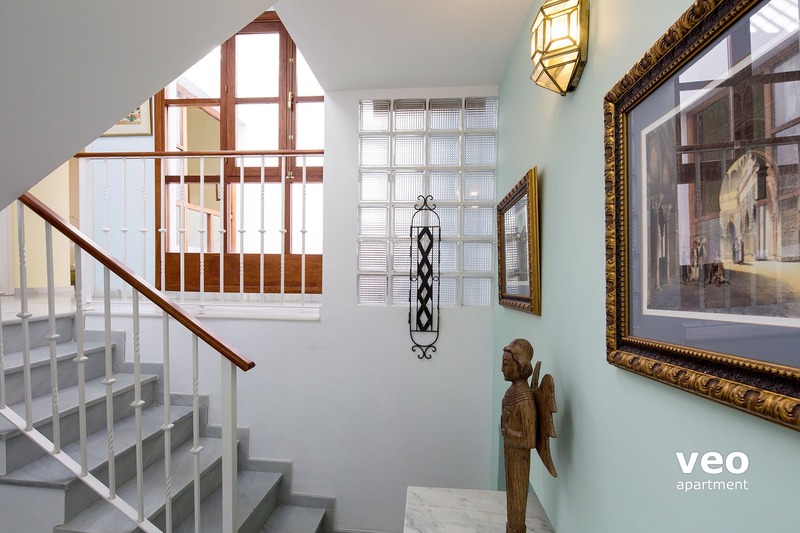 The house was very well equipped and all entrance and exit formalities were light and smooth. "The apartment supplied all that was advertised." Everything was as described and it all worked with the exception of the elevator, but don't think that was described as working. The physical taking over of the apartment went smoothly and the only drawback was that the cab couldn't actually drive on Pedro Miguel, but this was very minor. Might warn future guests they will be dropped in Plaza Monte Sion so they can prepare. The neighborhood had all necessary stores etc, and the Mercado is just down Feria and easy to frequent and get to. Thursdays are very busy on the Plaza but it is all gone by 4pm. "Plaesent, comfortable appartment in a beautiful city"
We've been for 4 days in Seville and had a pleasant stay in the Miguel appartment. There are clean rooms and enough space for 8 persons. The pool and terrace were very nice for some rest and quality time. In a few minutes walk you can visite nice sites of Seville. Some take a longer walk but that's no punishment in such a beautiful city!! "Great apartment, loved the outside space"
Great apartment with plenty room for a party of 8. The pool and terrace were lovely and the location is good, approximately a 20 minute walk from the cathedral. There is also a supermarket just round the corner. "Excellent point de chute pour visiter Séville"
équipement de la cuisine un peu léger. "Un confort, une proximité du centre ville = endroit idéal"
"A little piece of paradise in the middle of the city"
We had a really great stay. The apartment was excellent, really well stocked with whatever you could want, a great book collection and the pool was so much fun. "Very nice house in ok area"
Nicely appointed, roomy and clean house. 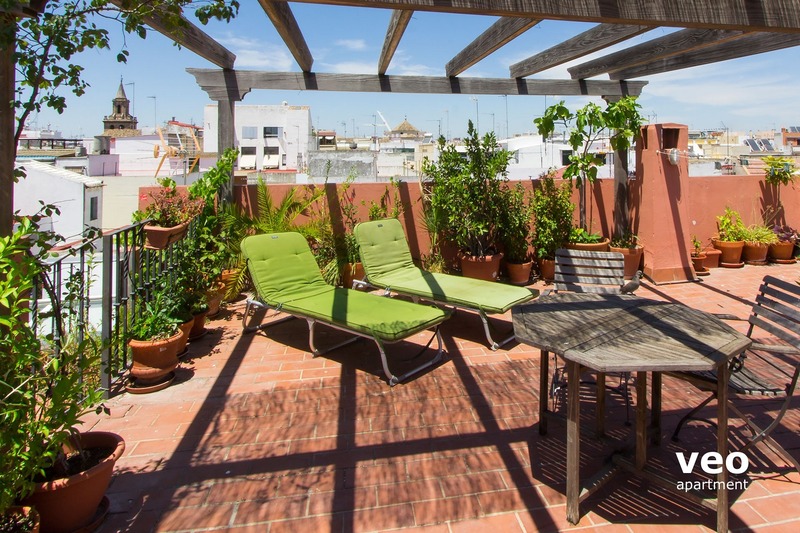 "Beautiful, spacious apartment with excellent roof-top views of Sevilla"
We loved the Miguel Terrace apartment. We stayed for a week and never felt crowded. 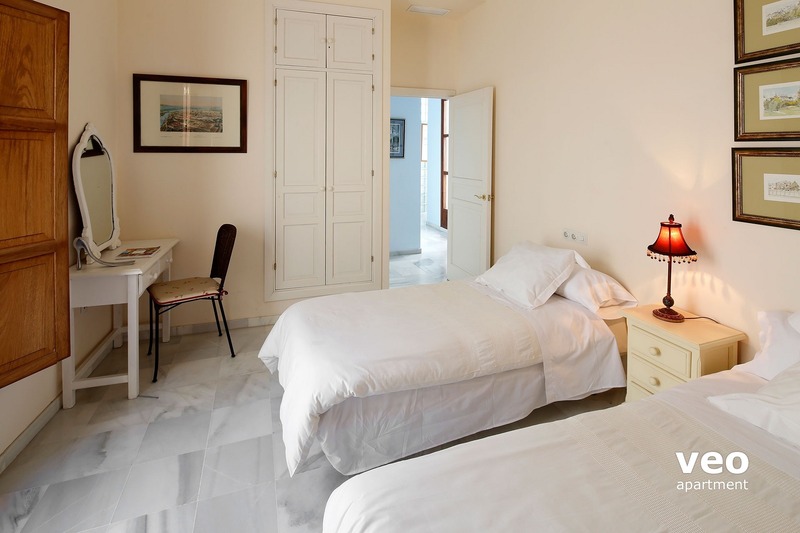 The bedrooms are spacious and comfortable, the kitchen modern and well-equipped and there is a great assortment of books and very nice artwork on the walls. 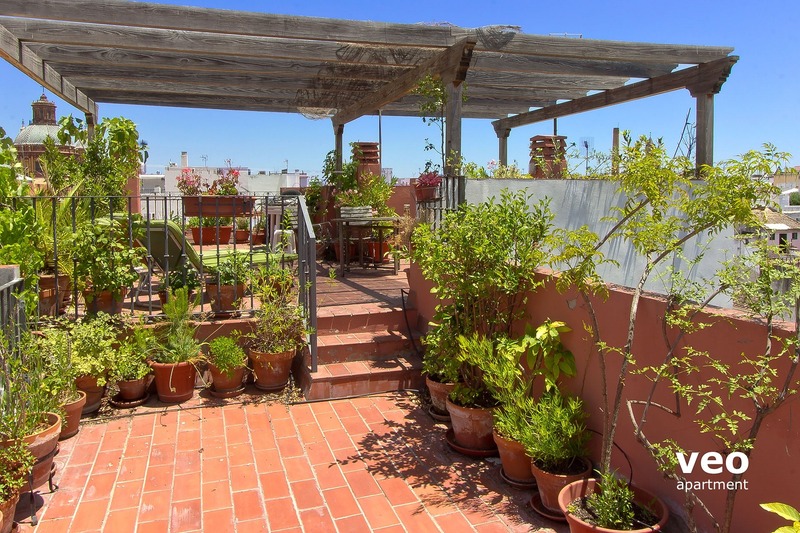 The best part for us was the two large terraces-one was poolside with a large table under a beautiful pergola and the other was a huge roof-top terrace with great views of the city. Plenty of shops and restaurants nearby. Beautifully laid out apartment. Comfortable, aesthetically furnished and scrupulously clean with everything one would wish to enjoy one's holiday, [little things such as hairdryer, teapot, toaster, bathmats and a good supply of towels!] were much appreciated. The outside areas were a bonus and the swimming pool were very enjoyable. It was an experience to be able to breakfast outside at the pool on the sunny mornings. Excellent location as we were able to walk everywhere. We felt very safe and well looked after. Staff were very kind and courteous and couldn't have been more helpful. All together a great apartment and an enjoyable experience. 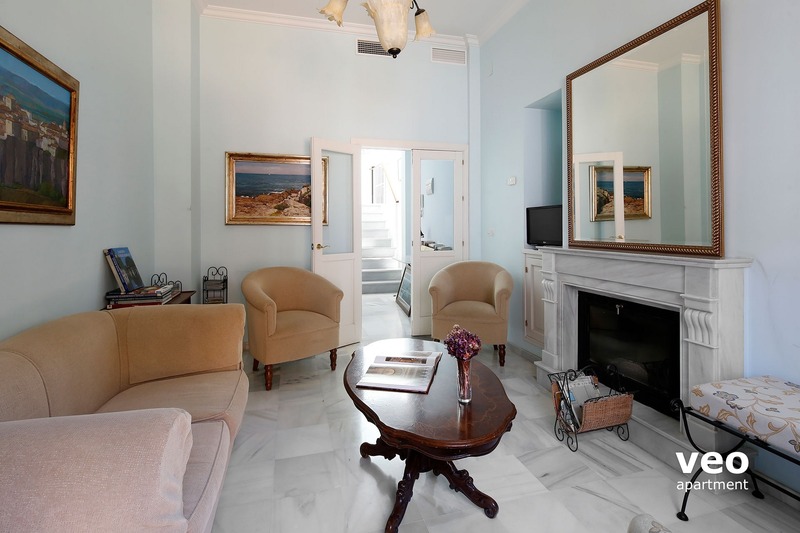 If you go for a citytrip to Sevilla - Go to this apartment !! 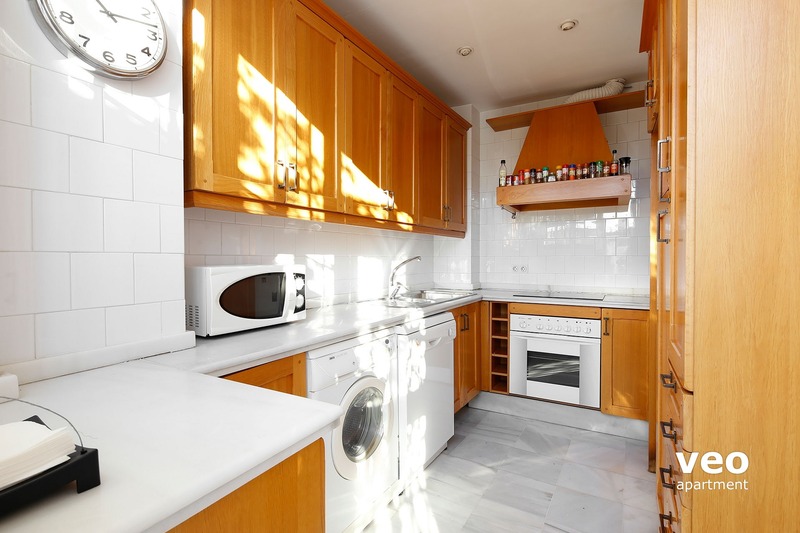 Really lovely apartment within walking distance to all the sites. It really was, what it promised to be! A really great house, that felt like a home! We also enjoyed the pool very much to cool down in the afternoon. For us the location was excellent, because we don't have a need to be near the main attractions. For newcomers in Sevilla it may be a bit difficult. Beautiful apartment in a great location. Good size rooms, lovely art work, good choice of books. The pool is a real plus as are the lovely terraces. Will return. We really enjoyed our stay at this apartment. We had a great time, the apartment is very big, everyone has his own badroom. No complaints at all. Very good location as well.